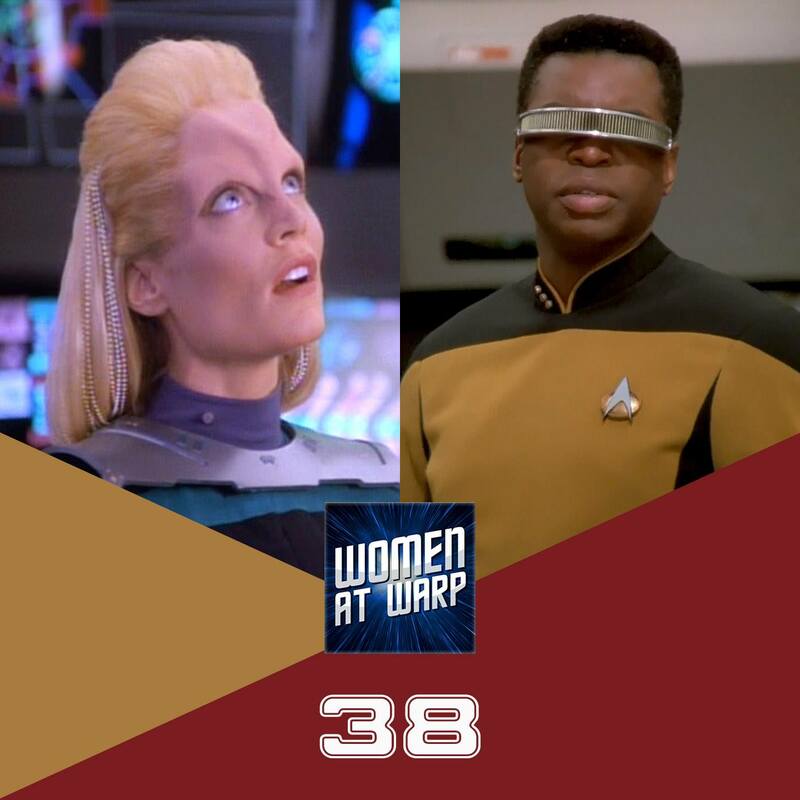 Special guest Karissa Mehr joins us to discuss how Trek has represented characters with physical disabilities, from Captain Pike to Melora, and of course Geordi La Forge. Stigma: Notes on the Management of Spoiled Identity by Erving Goffman. I have thought about how people with disabilities are often showcased in Star Trek in the past. Case in point, Nog could be put on this list, as he lost his leg during the seige of AR-558. But, his issues dealt more with veterans coming back from war far more than the loss of a limb. It kind of falls to the people who write the novels and even those who write fanfiction to place not only people with disabilities into the Trek-verse, but also more depictions of people of colour, women of colour and even gay and lesbian relationships and trans-gender people in positions of power within Starfleet. As far as a deaf person, I’d see this as a tactical advantage when going into a battle situation. Especially if each and every crewmember was taught a form of sign language. The deaf person could also have some sort of device that could translate verbal sounds into Morse code that could tap on their wrist or some such thing when they weren’t facing the person speaking. I’m a speech therapist and I work primarily with people who have multiple, complex, and severe disabilities. Most of the people I work with use Augmentative and Alternative Communication (AAC), expressing themselves through pictures, letter boards, or voice-output devices. (Stephen Hawking is one of the most famous examples of AAC-users.) So, watching The Menagerie was particularly frustrating for me. I have seen devices that allow people to produce complex sentences using only eye-movements, blinking, slight finger movements, or even sipping or blowing on a mouthpiece. And this is 2016! Once we are able to interface technology with brainwaves, the possibilities of AAC will expand dramatically. While it’s unfair to assume that writers in the late 1960s would be able to anticipate the scope and range that AAC would take, it’s immensely frustrating to me to see such a limited repertoire in Pike’s communication, when you don’t NEED to be a speech therapist to come up with a better system. As you said, he could have used Morse Code with that light (we know from other episodes that Starfleet officers can use and understand it). Alternatively, he could have indicated meaning or emotions (AAC users want to express feelings too!) through color, light intensity, or length of time the light stayed on or off. Enterprise has a computer which can literally speak to the crew, yet Starfleet couldn’t equip Pike’s wheelchair-lightbox-thing with some kind of voice output system? I don’t buy it. It seems clear to me that the writers limited Pike’s communication solely to add suspense to the story. They didn’t WANT Pike to be able to provide information about Talos IV, because it made the planet all the more mysterious. Thus, they created a situation in which a highly intelligent officer is unable to express himself, not because they wanted to tell a story about disability, but because it served the plot. The fact that they seemed to put so little thought into the development of assistive technology just makes it worse. Terrific episode with some really fascinating insight and discussion. Thank you – this is definitely an area I can see you revisiting. I saw Insurrection yesterday and it is baffling about Geordi’s eyes, especially as he was born blind, so the anti-aging affects of the planet wouldn’t necessarily cause his eyes to heal. I thought you might touch on Bashir, however I realised he had learning difficulties / mental disability. Would you cover this in the future? Combined with a few other direct (Reg Barclay, the deterioration of Sarek and Tuvok, B-4) and non-direct (Whom The Gods Destroy, Past Tense) examples of the treatment of mental illness and handicaps it could form an interesting episode. I love this show; thank you ladies for being so incredible, time after time. It’s an inspiration, as well as just plain fun to listen to other women who are at the same level of nerdy as I am. This was another great episode and an important topic. As usual, you discussed ST episodes I loved, ones I didn’t, and helped me see things in new ways! Cannot beat this. You mentioned an upcoming episode on The Loss and I hope someone brings up the issues of trauma. As someone who personally behaved a bit badly right after experiencing trauma, I feel for people who are criticized for how they initially deal with it. Thank you again for being so amazing and discussing these thought-provoking issues, fun characters, and all amazing things Trek!! I have a few thoughts on it, after listening to the episode today. It’s perhaps a little unfair to criticise the episode you discuss with Worf for wrapping things up too neatly, considering the aversion the series had at that time (IIRC?) to continuing storylines. If I remember what it said in The Fifty Year Mission correctly, they thought it would hurt syndication for TOS and TNG. Also, at another point I remember one of you saying that a society that was dedicated to warriors would struggle to function properly (I’m paraphrasing, you put it better than that :D). On that, I would assume the writers were drawing on some precedents, Sparta being the most obvious one (to a lesser extent, maybe Prussia and feudal Japan). Particularly in Sparta, I suspect a severely injured warrior would have reacted the same way as Worf. Would have liked to see Autism covered in this episode but I do appreciate you were wanting to focus on physical/visible disabilities and it was/is your intention to cover mental health stuff elsewhere (although Autism isn’t a mental health issue and admittedly you may have already covered it in another episode- I’ve only just found this podcast series so haven’t listened to all of them yet!). For me as an Autistic woman, Star Trek has been amazing and provided a number of the first Autistic role models (and especially FEMALE autistic role models) I’d ever seen. I don’t think there’s a single Star Trek series without a character who can be related to as Autistic and that’s really amazing. But what’s more awesome is the way in which those characters differ from each other. Obviously there’s Spock who has the emphasis put on him that he wants to be more human and understand human culture better (which makes sense that he wants to explore both sides of himself as he is half human) Data who wants to become completely human and absolutely embodies the internalised ableism that a lot of Autistic people have when trying to mimic correctly: if only I could get the act right then I would be perfect; as I currently am I am not perfect. Seven of Nine who is the first main female Autistic character in the franchise (someone correct me if I’ve got that wrong!) and is seeking to understand her own emotions and make connections with other people while still very much holding on to a sense of herself as different from the rest of the crew: unlike Data she doesn’t want to pretend until the act is perfect, she’s logical, it’s very useful and practical to be that way, other people are silly (in her eyes) and while yes she wants some friends and to express herself better, she doesn’t want to change the core of who she is because that’s just who she is and that’s ok. And then there’s (and this is debateable) B’Elanna who I have always related to VERY strongly: she’s technically minded, her social skills are really not good, she says exactly what she thinks, she can’t control her emotions very well- they control her, and she feels a lot of isolation because she communicates differently to other people. Obviously she is also the character used to explore being mixed race and being a person of two worlds, but there’s a lot to her that I also see as being Autistic or at least strongly relateable. The episode where she thinks about deleting her child’s Klingon DNA is fascinating because it can be read as internalised racism but also internalised ableism and this internalised ableism is something that you see A LOT in Autistic support groups, so it feels very very familiar to see it in her. There’s also Odo who I’ve heard spoken of as an Autistic character but sadly I am yet to have watched all of DS9 so can’t really comment on him. Lizzie, this is such a wonderful and informative comment and I’ve been thinking about it ever since you wrote. In my mind I keep remembering it as a blog post in itself! You make SO MANY wonderful points and I thank you for helping me see things a different way. I’ve been deep in (yet another) Voyager rewatch lately, so this is helping me see the characters, especially Seven, in an entirely new way. I appreciate you writing this!